Today my commute reminded me of every slasher film I’ve ever seen (or half-seen between fingers and through holes in an afghan). I (potential slasher victim) asked the hotel concierge how to get to the building where my training was to take place, without exposing myself to the Edmonton Winter. (Seriously, why do people live in Edmonton? Ten minutes outside and my lungs were killing me). 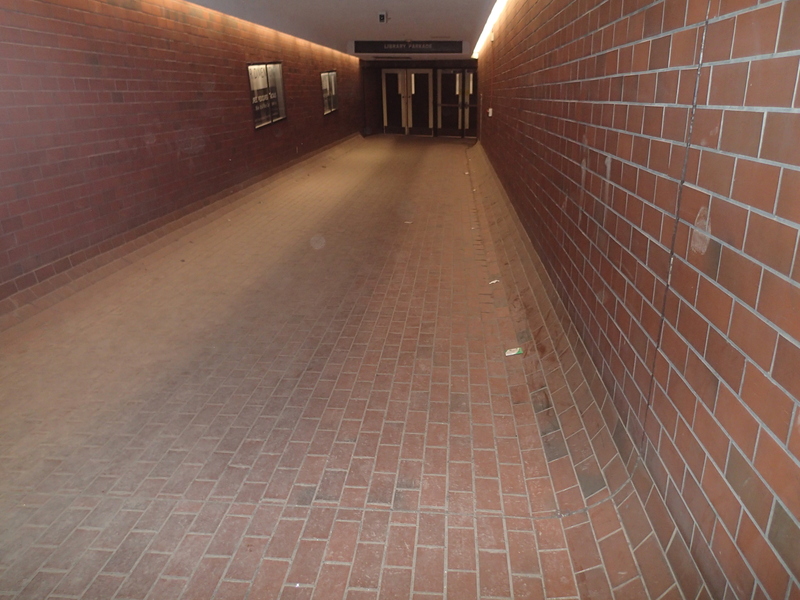 The concierge described the underground route to Canada Place as “easy” and provided a map. Good service, but if it was actually easy I wouldn’t have needed a map. Following his instructions I walked into a chilly brick-lined hall. The empty walkway sloped down to a set of industrial doors. It was lonely, poorly lit and ominous. No one leaped out at me so I proceeded, finding myself in an equally creepy parking lot (low ceilings and nasty air that would have made running away from a killer challenging). My full journey had me travel through stairwells and hallways, a parking lot, a theatre and then finally into the office building I was looking for. By the time I arrived the writer in me had devised a whole scene of me being pursued by a man in a mask. The death scene in my slasher flick would have been on the stairs of the theatre, with a view of the snow outside providing a great contrast for the blood as it splattered against the windows. Sure, the setting inspired a great spontaneous writing exercise but it made the walk…tense. It was so creepy that I might just set a scene there in the future, but not creepy enough to make me walk the five blocks at exposed street level. Settings often inspire my writing. I enjoy walking through old buildings, and driving through small towns. Places like that speak to me, telling me stories about people who have lived there and often providing a scene that inspires a whole story. Take a walk through your community looking at buildings. When you find one that speaks to you sit down for a moment and look at the building. What made it interesting to you? Is it the building that called or a character you can imagine living, working or running from the building? Take your time to feel the space then spend ten minutes writing the story of this place. Make sure to snap a few pictures while your there to keep the inspiration going when you get home. Happy writing. NB. If you can’t find a building that inspires you, take a look at the Forgotten Detroit website, it made me want to travel to a city I had never even considered visiting previously.